Al-Hashd Al-Sha'abi forces in Fallujah, Iraq. Iran's Press TV boasted on Saturday that "Hashd al-Shaabi stop US military patrol in Iraq's Mosul." 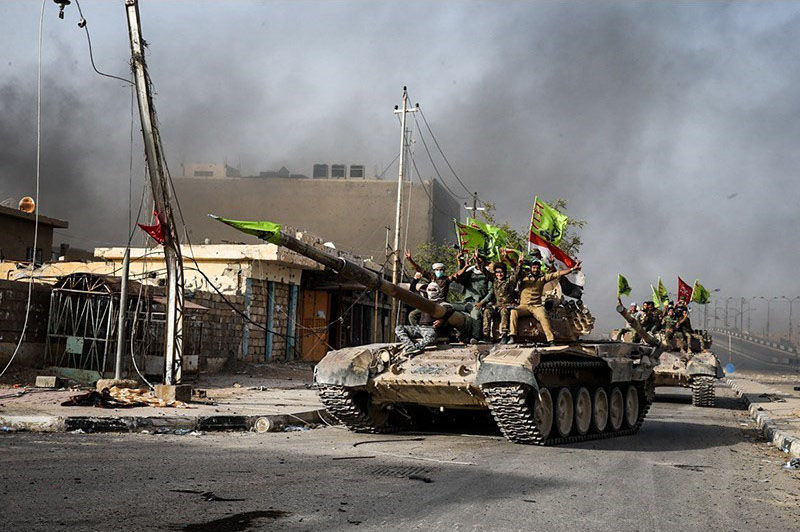 The Hashd – also called the Popular Mobilization Units – are a group of militias that have grown in the last several years in response to the ISIS attack on Iraq in 2014. Some of the militias, such as Badr, have deep roots in Iraq, with leaders who fought alongside the Iranians during the Iran-Iraq war. Others, such as Qais Khazali's Asaib Ahl al-Haq, were once considered terrorist gangs that targeted US troops and Sunnis in Iraq, after the US invasion of 2003. Khazali was once held at Camp Cropper, a holding facility run by the US Army. In December 2017, he went to Lebanon, from where he threatened Israel. The PMU in Iraq increasingly play a similar role to Hezbollah in Lebanon, supporting armed militias and members in parliament. The Fatah Alliance, led by Badr's Hadi al-Amiri, came in second in Iraq's May 2018 elections. US forces in Iraq, deployed as part of the coalition's anti-ISIS war, have not worked with the PMU during the war. This has presented a complex challenge because, ostensibly, the US is allied with the PMU in the anti-ISIS effort, even as the US administration of Donald Trump has ended the Iran deal and sought to confront and sanction Tehran. In the last two years, the militias have increasingly threatened the US. In January 2018, Harakat Hezbollah al-Nujaba often called for US forces to leave Iraq and issued threats against the US. In June 2018, Kata'ib Hezbollah also threatened to attack US forces after an air strike hit its fighters in Syria. In September 2017, they had already said they were ready to fight the US. In an interview published last week, Khazali said the US should leave Iraq. These tensions have now boiled over in Mosul. US soldiers on patrol near the once-swank Nineveh International Hotel, found a street blocked by PMU vehicles. PMU members held their rifles pointed skyward looked at the Americans while a helicopter circled in the background and landed at an Iraqi base nearby. The Americans share the base with the Iraqis, according to locals. It was only the first or second patrol by US forces in this particular area, sources told the Middle East Center for Reporting and Analysis (MECRA), which published reports of the confrontation. Kurdistan24 reported that the US forces had air support during their patrol. The Coalition responded that there was a routine patrol and no confrontation with anyone . "The Coalition is here at the invitation of the Iraqi government and this was coordinate with the Iraqi Security Forces." After the confrontation, the PMU produced a video threatening the US. Rezvan Al-Anzi, a PMU commander, said on Saturday that the US was making "deliberate provocations." The PMU claims the US is creating insecurity in the area. Locals in Mosul also are divided on what is happening. Most Mosul residents are Sunnis who fear the role of the Shi'ite militias. But they also have been recovering from years of war. The city is hosting cultural events and rebuilding. They don't want to be in the middle of an Iran-US struggle played out with Iranian proxies. They don't want tensions, some residents have written online. In other parts of Iraq, the PMU has been increasing its rhetoric and becoming increasingly confrontational with the US. A unit of the PMU also blocked an American patrol in Anbar in mid-January. Some PMU members have indicated that they expect to confront the Americans one day. An inquiry to the US Central Command about the incident was not answered as of press time. While the US is withdrawing from Syria, in December 2018, Trump told troops at Al Asad Airbase in Iraq that US forces would stay in Iraq and continue to monitor ISIS threats. Islamic State has been carrying out attacks in Iraq, however, the PMU says it wants to fight ISIS without US help. The Iraqi government is more circumspect. Prime Minister Adel Abudl Mahdi appeared non-plussed that Trump came to Iraq and met US forces but didn't come to Baghdad. Former Iraqi prime minister Haider al-Abadi in October 2017, scolded then-Secretary of State Rex Tillerson, claiming the PMU was the hope for the future of Iraq. But Iraq wants support from the US for reconstruction and continued US training of key security forces, such as pilots or Iraq's Counter-Terrorism Service. The US is therefore in a difficult relationship with Baghdad and the PMU, amid tensions with Iran. The message in Mosul to US forces was that this part of Iraq belongs not only to Iraqis, but to the PMU, and US forces should be aware. The confrontation coincided with the 40th anniversary of the Islamic Revolution in Iran, and appears to be part of various attempts by pro-Iranian groups to test the US.